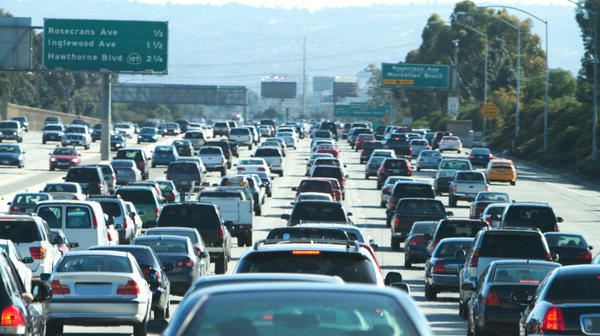 Los Angeles is no stranger to traffic jams and road rage. It's not unusual for awful traffic conditions or incompetent driving to make some people really angry behind the wheel. But when enraged drivers actually lash out at others on the road, that's road rage — and experts say it can be a sign of deeper emotional problems. The term road rage was coined in Los Angeles – a city long known for its epic freeway jams. Mike Shen got a taste of how bad it can get shortly after moving to L,A., when a woman viciously tailgated him on the freeway. "She got so angry that she started pacing me to my right," Shen says. "She wasn't looking at the road, she was literally yelling — out the window — racial epithets at the top of her lungs." So Shen decided to take his road rage digital, starting the blog LA Can't Drive, where he and others vent about the disastrous driving they've seen. Often, it's distracted driving that's to blame – people eating, applying makeup or even shaving behind the wheel. Shen recalls seeing one driver reading the newspaper while merging onto the freeway. "Literally in my rearview mirror, I didn't see the person's face," he says — only the spread out newspaper. In fact, surveys show that the more drivers are distracted, the more other drivers get angry and start honking, cursing, making obscene gestures and waving their fists in the air. In its annual survey, the road club AutoVantage asks members about bad driving: Did they curse at another driver? Make an obscene gesture? Wave their fist in anger? Purposely slammed your vehicle into another car? "Oddly," says AutoVantage official Michael Bush says, "in Washington, D.C., you're four times more likely to have somebody drive into you on purpose than anywhere else on the planet." Clearly, ramming into someone else on purpose is an extreme version of road rage. But this type of outburst is exactly what might signal a deeper underlying problem, says psychiatrist Emil Coccaro at the University of Chicago. It's called Intermittent Explosive Disorder, and it can affect as much as 6 percent of the population, says Coccaro. It doesn't just happen on the road but at home, on the job, even when out with friends. "Those outbursts can be temper tantrums, throwing things around, breaking things, pushing, shoving, hitting people," he says. They can be caused by any number of underlying problems, Coccaro says – for example, paranoia. "If somebody gets in their face, they're going to respond aggressively to that," he says. Like: "So who're you looking at? Why are you looking at me like that?" Other people are emotionally unstable and explode when they're rejected. Still others are compulsively rigid and explode when their sense of "order" is upset. "Their fuse for exploding is very, very short," says Coccaro, "so if something happens that they're not happy with, there's not much time for them to think of other ways to handle their reaction to it." Their fuse is short for a number of biological reasons. For starters, he says, people don't produce enough of the "happy" hormone, serotonin, which is thought to be a behavior inhibitor. "It's basically the brakes," he says, "and if your brakes are bad, you're going to get into trouble." At the same time, people produce too many of other brain chemicals that promote aggression — a "dangerous combination," says Coccaro, but one that can be treated. Medications like antidepressants and mood stabilizers can help to restore the brain's chemical balance. Cognitive behavior therapy helps patients not take things personally, and coping techniques like a time out — just leaving the scene — can make a difference, says Coccaro. Of course, if you're driving in your car, you can't just leave the scene. But you can stop engaging in the aggressive behavior. These techniques won't completely "cure" the disorder, but they can certainly help contain the explosions. On a Monday morning it's MORNING EDITION from NPR News. I'm Steve Inskeep. And in Your Health on this Monday, teens and alcohol. But first, we're going to talk about road rage. It's not unusual, of course, for awful traffic conditions or incompetent driving to make some people really angry behind the wheel. But maybe that's not really why people are angry. Road rage, it turns out, can be a symptom of deeper emotional problems, as NPR's Patti Neighmond reports. PATTI NEIGHMOND, BYLINE: When Mike Shen moved to Los Angeles, he acquired a new fear: road rage. Take the time he was viciously tailgated by a woman driving a beat up Jeep. MIKE SHEN: She got so angry that she started pacing me to my right. She wasn't looking at the road if front of her. She was driving right next to me, literally yelling out her window racial epithets at the top of her lungs. NEIGHMOND: After that, Shen decided to take his road rage into the digital age. SHEN: I started a blog called LA Can't Drive.com. NEIGHMOND: Shen says the blog is cathartic, because Los Angeles is home to some of the worst driving he's ever seen. SHEN: Just the other day I saw someone merging onto the 134 freeway with a newspaper completely spread out in front of them. Like literally in my rearview mirror I saw just a spread-out two-page newspaper. NEIGHMOND: Shen says maybe it's because people spend so much time in their cars, they try to multitask. Well, maybe I can eat an apple behind the wheel. And then from there I say, well, if I'm eating an apple maybe I can try to steer with my knee, eat a bowl of cereal behind the wheel, which I've seen, or shaving. I see that all the time. Or doing their makeup. Surveys show the more drivers are distracted, the more other drivers get angry and start honking, cursing, making obscene gestures, waving their fists in the air. Michael Bush is an official with the road club Auto Vantage. In their annual survey, they ask members about bad driving. MICHAEL BUSH: Did you curse at another driver? Did you make an obscene gesture towards another driver? Perhaps wave your fist in anger? And interestingly, we also asked, you know, have you ever purposely slammed your vehicle into another car? NEIGHMOND: Deliberately slamming your vehicle into another car? The startling answer is yes. BUSH: Oddly, in Washington, D.C. you're four times as likely to have someone drive into you on purpose than anywhere on the planet. NEIGHMOND: Clearly an extreme example of road rage. But this type of outburst, says Psychiatrist Emil Coccaro with the University of Chicago, may signal a deeper underlying problem. It's called Intermittent Explosive Disorder. And it happens on the road, at home, and even on the job. DR. EMIL COCCARO: The outbursts can be temper tantrums, could be throwing things around, breaking things, pushing, shoving, hitting people. NEIGHMOND: Aggression like this, says Coccaro, can be caused by any number of emotional problems. For example, paranoia. COCCARO: If somebody gets in their face, they're going to be threatened and they're going to respond aggressively to that. So who're you looking at? You know, why are you looking at me like that? NEIGHMOND: Some people are emotionally unstable and explode when they're rejected. Others are compulsively rigid and explode when their sense of order is upset. COCCARO: Their fuse for exploding is very, very short. So if something happens they're not happy with, there's not much time for them to think of other ways to handle their reaction to it. NEIGHMOND: That fuse is short for a number of biological reasons. For starters, Coccaro says, people don't produce enough of the happy hormone serotonin. COCCARO: Serotonin is thought to be a behavioral inhibitor. It's basically the brakes, and if your brakes are bad you're going to get into trouble. NEIGHMOND: At the same time, people produce too many brain chemicals that promote aggression. It's a dangerous combination, but one that can be treated. Medications like antidepressants and mood stabilizers can restore the brain's chemical balance. Cognitive behavior therapy helps patients not take things so personally. And Coccaro says there are coping techniques. COCCARO: One of the simplest strategies for that is called the time out. And you just leave. You say, excuse me, I've got to go. You get out and you try to soothe yourself. NEIGHMOND: Now, you can't get out and leave if you're in your car, but you can stop engaging in the aggressive behavior. These techniques won't completely cure the disorder. But they certainly can help contain the explosions.